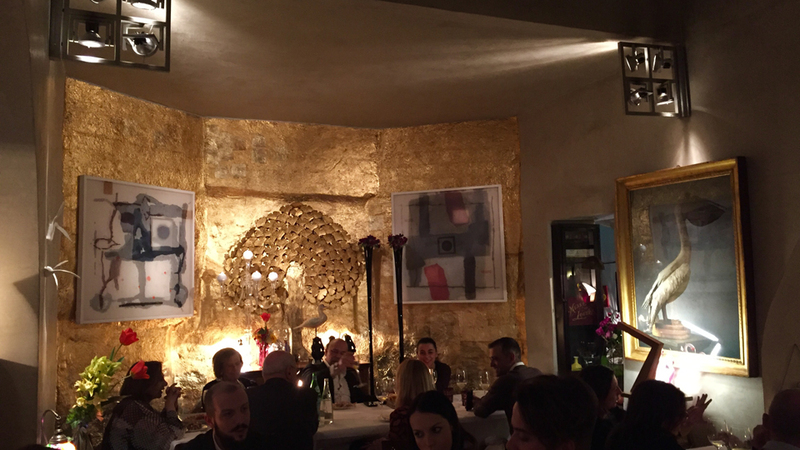 Lio Pellegrini is an eclectic space housed in a 16th century building that offers classically rendered dishes. There are no bells and whistles here, just solid cooking with an eye towards classic recipes and traditions. That, along with well-sourced ingredients and an interesting wine list make for memorable dining. Bergamo is, outside of Venice and Rome, my favorite city in Italy. It really couldn’t be otherwise, given that it is essentially where my life began (my Italian parents moved back to Bergamo from Canada, where I was born, when I was three and so for all intents and purposes my life starts in Bergamo). I never went to Lio Pellegrini in those early days, for the simple reason the restaurant was opened only in 1984 by Nila Pellegrini, current owner Giuliano (Lio) Pellegrini’s mother (he and his wife Silvia Pellegrini are now the driving forces). Over the years, however, I have come to know and really enjoy this standout restaurant. The Pellegrinis avoid the myriad foams, jellies, sponges and geometric constructions that often plague today’s many modernist eateries blessed with much acclaim but ultimately dubious talent levels in the kitchen. The “stepping back in time” feel is further driven home when you enter the 16th century building, as the restaurant’s three rooms are crammed full with an unbelievable knick-knack of vintage lamps, posters, paintings, statues and statuettes, and more. Believe it or not, all of these artefacts are on sale. The atmosphere is warm and friendly, and you’ll find yourself surrounded by mostly well-heeled locals who seem to be regulars, including families and their generally well behaved children. When nice weather beckons, you can eat in the beautiful garden. My most recent meal at Lio Pellegrini was wonderful. 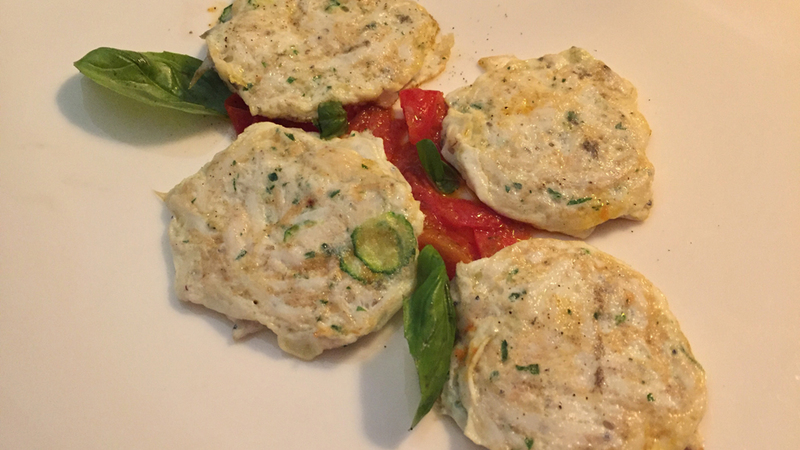 The rossetti (baby red mullets) could have used a larger dose of the delicious tomato sauce for added spring and vibrancy, but they were remarkably flavorful and tasty. 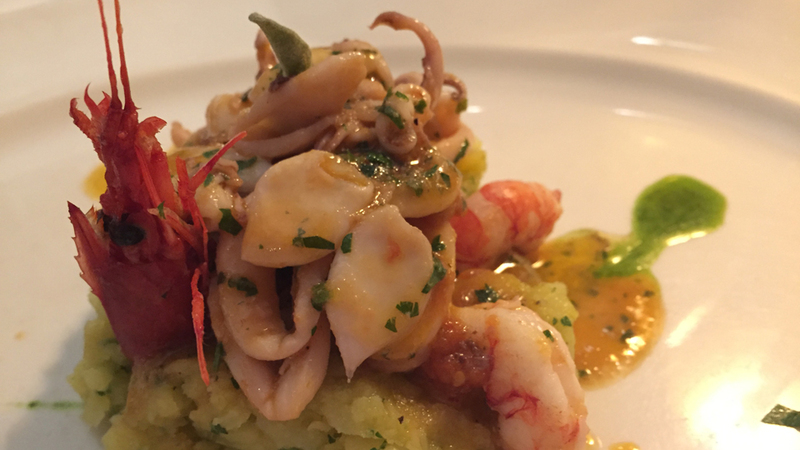 The next dish, the roughly mashed potato with shrimp, squid, European Flying squid and anchovies was lovely, with the potato mash offering a sounding board for the spate of different flavors and textures delivered by the tasty seafood. 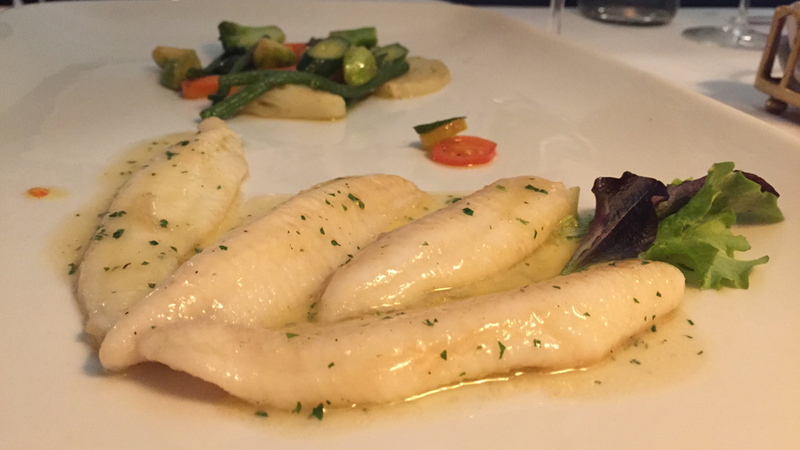 If you love food as much as I do, you’ll no doubt find Lio Pellegrini’s distinction between totanetti (small totani) and calamaretti (small calamari) downright confusing. How many I wonder have ever heard (or even seen written anywhere) the name of “European Flying squid”? While I grew up in Italy and consider the totani and calamari two different animals, most people, even many Italians, believe the two to be interchangeable words for the same thing, ie. squid; or, more precisely, that the word totani is local dialect for squid in specific Italian regions such as Liguria, Calabria and Sardinia. Not so: besides the fact the two look slightly different to a trained eye (I’ll admit to having long dreamed of becoming a zoologist or a veterinarian as a child) the word ‘squid’ is loosely used to describe roughly twenty different members of two different families. One of members is Todoarodes sagittatus, listed as European Flying Squid or red squid and different from Loligo vulgaris, or squid (the latter are always white, while the totano has a reddish hue, explaining the red squid name, but granted, only a marine scientist could really tell the two apart when lying on a plate in a restaurant). In my personal opinion, I have always felt totani to be more flavorful and have greater spring to their texture, but I could well be looking too hard for a recognizable difference that is really neither obvious nor clear. Given that calamari are so popular in today’s eateries, readers might like to know that calamaro is an Italian word that first became part of the English language already back in the 17th century; it’s a name that most likely derives from the latin calamarium (and the Greek word kalamos) meaning ink well and which derived in turn from calamus, or reed pen, a reference to the animal’s long internal shell and ink). All of this would be moot if the critters weren’t so darn tasty, and a wonderful take on them such as Lio Pellegrini’s easily sparks these sort of learning thought processes. However, the night’s best dish was as simply spectacular, incredibly precise rendition of the famous French sole meunière, that has over the centuries also become a classic of Italian cuisine. The meunière or mugnaia monicker refers to the wives of the meuniers (French) or mugnai (Italian), those men that used to work in mills to produce flour with which to make bread; their wives used to dip the sole filets in flour prior to pan-frying them in butter and then bathed them in a delicate sauce of lemon and parsley. And so a standout recipe was born. Aftre all that, the veal cutlets prove a major disappointment, as the cheese and prosciutto combined to make for a very salty taste (I only ate a couple of morsels). The best of the three, relatively good, desserts was the thin berry tart. Given the high level of the food, the wines had a tough act to follow, but acquitted themselves magnificently, and then some. I have been fortunate enough to have the 2008 Frédéric Magnien Montrachet numerous times over the years and every time it confirms itself as a simply spectacular, unforgettable Chardonnay characterized by unbelievable tension, precision and minerally length. Words really can’t do this beauty justice. It offers a panoply of lime, lemon curd, crushed stones, jasmine, candied pineapple and still more aromas and flavors in a vibrant, penetrating delivery of truly memorable purity. 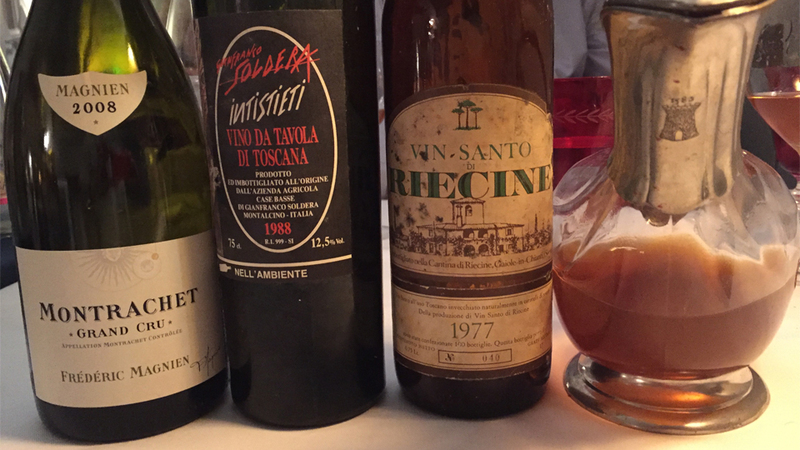 Almost as good is the outstanding 1988 Soldera Case Basse Intistieti Vino da Tavola, a simply magnificent Sangiovese that is aging beautifully and that easily bests many Brunellos of the same, wonderful, vintage. The Intistieti Vino da Tavola was, at the time, the middle wine in Soldera’s range, a notch below his Brunello and a step above the Rosso di Montalcino. In its youth, it was often a truly marvelous, midweight wine that was bottled with less time in barrel than the Brunello (though some vintages, like the 1991, were problematic and essentially undrinkable from the start). In my opinion, the 1988 is probably the best Intistieti Vino da Tavola Soldera ever made, and this specific bottle proved absolutely spectacular, with still high but harmonious acidity really extending the pristine red berry, botanical herb, violet and flinty aromas and flavors on the long, pretty back end. Last but not least, the 1975 Riecine Vin Santo is an absolute classic, gorgeous Tuscan Vin Santo from what used to be, back in the 1970s, one of Chianti Classico’s five or six best estates. Owners Palmina Abbagnano and John Dunkley created a masterpiece with Riecine that produced my go to wines in the 70s (along with Sergio Manetti’s and Badia a Coltibuono’s splendid opuses) anytime I wanted a glass of outstanding Sangiovese. Still vibrant and very precise, the 1975 offers a very clean mouthfeel and delicately oxidative nuances to the white plum, white chocolate, pear, delicate caramel, herbal and raisin notes that linger long on the taste buds. 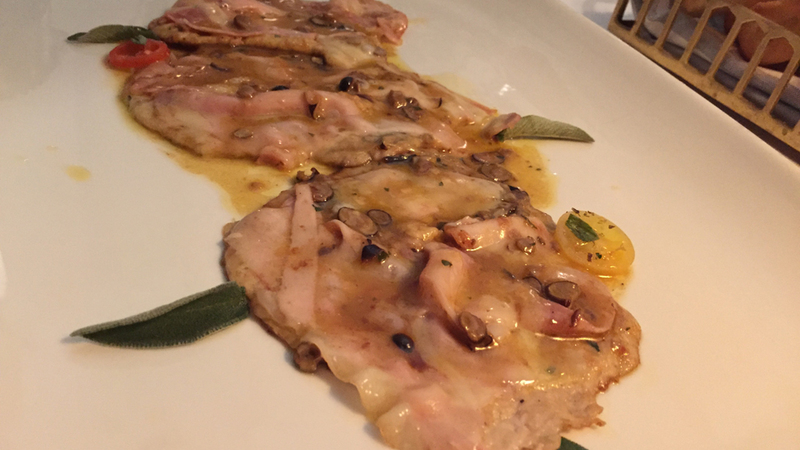 As is often the case, not every dish at Lio Pellegrini hits all the right notes, but there were plenty of dishes that easily rank among the best I have had all year. Another positive is that one walks out of the restaurant not just happy and relaxed, but with considerable spring in the step, not feeling at all heavy or bloated. After a meal like the one I’ve described here, a little heaviness might have been expected or even unavoidable, but that was not the case at all. Bravi tutti!